Truly, a modern wonder of the world, the very recognizable Taj Mahal (in Agra, Uttar Pradesh, India) is the legacy of man's love for his wife. In 1627, Shah Jahan became the 5th in the dynasty of Moghul Emperors to rule India. Befitting a man of his status and wealth, he married three wives. But his favorite was his queen, Arjumand Banu. She was crowned with the title Mumtaz Mahal or "Chosen One of the Palace." 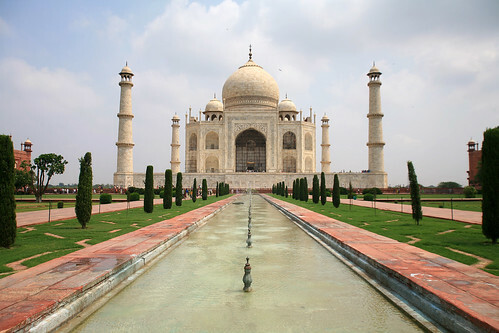 Shah Jahan so loved Mumtaz Mahal, that he pledged that he would forever honor her with the greatest monument ever seen by the world. But Shah Jahan never imagined that he would need to fulfill his promise so soon after their marriage. Mumtaz Mahal died giving birth to her fourteenth (...yes fourteenth) child at the tender age of 39.